Contemporary Kitchen Design, More Renovated Than Ever. | Rincomatic Blog. Nowadays, kitchen is evolving towards comfort and functionality, allowing it to enjoy a pleasant space around which life revolves at home, and this is perceived in the design of contemporary furniture, in which all the elements that take part in its installation contribute to achieve a modern style, in line with the current decoration trends and new habits of life. The kitchen has become to be the social center within the house, where the best gatherings take place and it must be taken into account in order to get a personal kitchen ready to enjoy without putting aside the use of space. What characteristics define a contemporary design?. Designs where the straight line marks the style, taking it into account in the distribution of the kitchen cabinets when it comes to locating the drawers and doors. Smooth surfaces where the design will be in the combination of materials, textures and colors, always following a professional kitchen project where this combination will be based on space, natural light and personal style. The absence of handles creates clean spaces free of visual obstacles, giving prominence to distribution and finishing. Optimal usage of space in upper and base cabinets, pantries and corner cabinets. Regarding the measurements of kitchen furniture, the standardized moves to a second place since we will find upper, base and column cabinets with different measures that will be adapted to a personal project, taking into account the aesthetics and ergonomics of those who live in this kitchen. Organization, storage and lighting. Essential concepts in today’s kitchen. 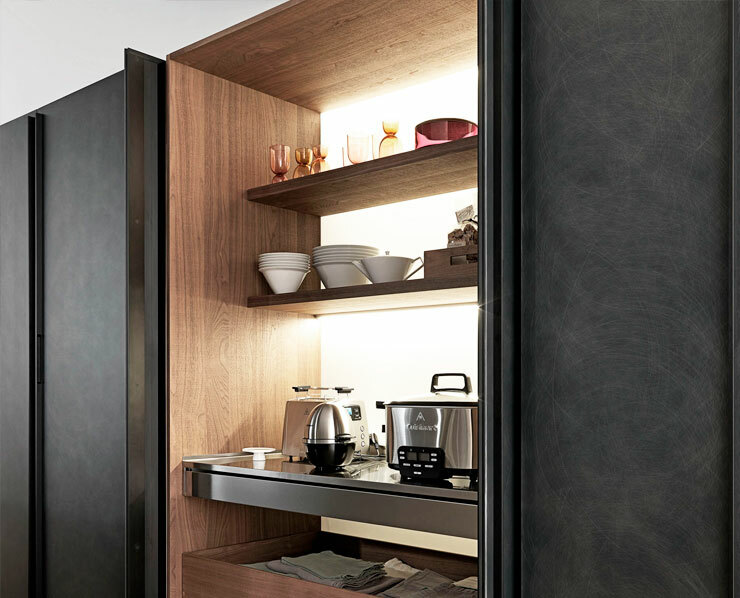 The essence of contemporary kitchen furniture lies in the comfort of opening and closing drawer fronts and doors and easy access inside the cabinet, especially in corner cabinets where accessibility is a factor vitally important. The order is crucial, and within the contemporary style, there is a specific cabinet and space to store each utensil. The lighting in the modern kitchen practically comes as standard, with strips and LED profiles under the wall cabinets facilitating the vision of the interior with much more clarity while we work on the countertop apart from LED lighting inside the cabinets, getting visualized to the last corner or nook. The interior of the units is also part of the design in the kitchen and we find different accessories that, in addition to maintaining order, make it more attractive when we open a drawer or a door. The contemporary kitchen is personal where all the elements are chosen according to the needs of each house, so that, at the same time, we can see different decorative styles within the contemporary style. Integrated handles, LED profiles and Gola handles. Some of the key elements in cabinetry. Gola system for handleless kitchens, facilitating the opening of drawer front by means of a profile designed according to the model of door and cabinet. Going for the personalization of the kitchen, when a handle is more comfortable, we have an integrated profile handle on doors, following the maxim of a minimalist style that is to get clean surfaces. An opening system for kitchen cabinets that allows the complete visualization of the interior and facilitates its access is essential. 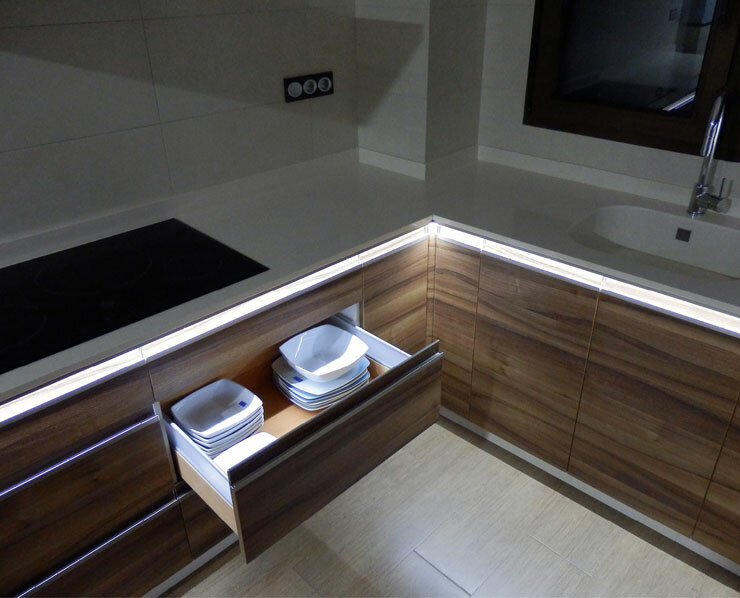 An illuminated profile should not only create a pleasant atmosphere inside the kitchen, but also allow to see what is inside the cabinet and drawer. Speaking of a contemporary kitchen cabinet is talking about innovation, comfort, extreme functionality … but, above all, it is talking about a personal kitchen where the choice of each element has a reason and nothing is left to chance because behind a modern kitchen design there is a meticulous project made with enthusiasm.